St. Cletus, also known as St. Pope Anacletus was the third Pope, after St. Peter and Pope Linus. His papacy was from 80 to 92 when he died. His pontificate was known as both Pope Anacletus and Pope Cletus, he can be referred to as either, but the Church has clarified that they are both the same Pope, and venerate him as St. Cletus. In the February 14, 1961 Instruction of the Congregation for Rites on the application to local calendars of Pope John XXIII’s “Rubricarum Instructum of July 25, 1960” decreed that the “Feast of St. Anacletus” on whatever ground and in whatever grade it is celebrated, is transferred to April 26th, under it right name, “St. Cletus”. The Roman Martyrology mentions that the Pope is only under the name of “Cletus”. Eusebius, St. Irenaeus, St. Augustine and St. Optatus all suggest that both names refer to the same individual. The name Cletus in ancient Greek means “One who has been called” and Anacletus means “One who has been called back”. It also means “unimpeachable. St. Cletus was traditionally said to have been Roman, and to have been Pope for twelve years. Although, according to the “Annuario Pontificio” it states, “For the first two centuries, the dates of the start and the end of the Pontificate are uncertain”. It gives the years 80 to 92 as the reign of Pope Cletus/Anacletus as the same person. Other sources outside of the Church give the years 77 to 88. When in doubt, it is best to go by the Church records from the Annuario Pontificio. Tradition has it that Pope Cletus divided Rome into twenty-five parishes, showing the need for smaller Church communities shortly after the reign of St. Peter. One of the few surviving records concerning his papacy mentions him as having ordained an uncertain number of Priests. He was buried next to his predecessor, St. Linus in St. Peter’s Basilica, in what is now known as Vatican City. His name, “St. Cletus” is included in the Roman Canon of the Mass. The Tridentine Calendar reflects his feast day as being on April 26th. Use of this 1960 calendar, which is included in the 1962 edition of the Roman Missal, continues to be authorized under the conditions indicated in the Summorum Pontificum. 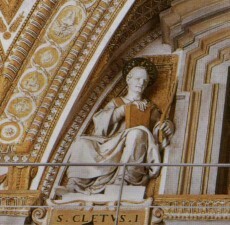 The exact cause of his death is unknown, but St. Cletus continues to be listed in the Roman Martyrology among the saints of April 26th. One can safely assume that he was a martyr for the faith. St. Cletus, also known as St. Pope Anacletus was the third Pope, after St. Peter and Pope Linus. His papacy was from 80 to 92 when he died. He was Roman by birth. His pontificate was known as both Pope Anacletus and Pope Cletus, he can be referred to as either, but the Church has clarified that they are both the same Pope, and venerate him as St. Cletus. He was known for dividing Rome into 25 parishes, showing the need for small Church communities that would all be connected and make up the greater Church as a whole. His Papacy set this in motion with the concept of parishes; clear back as our third Pope.